The term ‘daimyo’ simply translates to ‘large private land’ and they belonged in the upper class in feudal Japan. The daimyo lords were at the top of military class just below the shoguns, and were heads of the samurai. The daimyo were seen as extremely powerful figures, and they were, in fact, often more powerful than shoguns, as how powerful the shoguns were completely dependent on how strong the daimyo were and how many of them they had under. The main roles of the daimyo in feudal Japan were to protect the shoguns and being rulers of people, land and property of the assigned area. 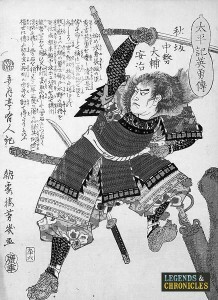 An illustration of daimyo Wakisaka Yasuharu. The daimyo were initially given land by shoguns, in return, they provided military support including samurais who served daimyo and were ordered to live in castle towns. The reason for this was so that they could be available to act on to protect their daimyo quickly in the case of emergency. Daimyo often gave their strongest samurais land in order to further gain their loyalty. The daimyo were able to have wealthy lifestyles. One of the reasons for this was due to the daimyo not having to pay any taxes. Furthermore, the daimyo had the power to control how much tax was paid to him by farmers, craftsmen, merchants and villagers. At the beginning of the feudal Japanese period, they were referred to as shugo daimyo. Not all land were owned by daimyo during this period, however, they got their wealth from collecting huge amounts of taxes from the residents of their controlled towns. The shugo daimyo were replaced by the sengoku daimyo at the end of Muromachi period, which prevented people other than the daimyo and upper class samurais to hold any ownership of land. This meant all land in Japan belonged to the daimyo. How the daimyo dressed was very similar to the shoguns and samurais. The daimyo typically wore kimonos of different colours and the colours often represented how powerful they were. The dark black colour represented the most powerful, followed by red, green and purple. 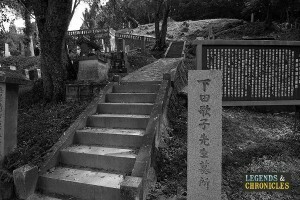 A Japanese graveyard originally built for a daimyo. Towards the end of Muromachi period and the beginning of the Edo period, the daimyo lords started becoming even more powerful, and led to take control the whole of Japan. Some of the most well known daimyo in the history o feudal Japan were from this era, including Oda Nobunaga, Toyotomi Hideyoshi and Tokugawa Ieyasu before becoming the first shogun of the Tokugawa Shogunate in 1600. The Tokugawa bakufu ruled Japan for the next 300 years following this before the Meiji period began. In 1870, following the Meiji restoration, the new government ordered the daimyo to return all their land to the emperor, in order to stabilise the country’s economy. This allowed other people to own their own land, thus, creating a fairer tax collection systems. This led to the significant weakening of the daimyos’ power. During of the Meiji period, the daimyo, samurais and other military classes from feudal Japan had lost their privileges.